b. 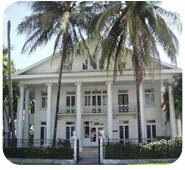 The Neo-Classical style is an eclectic revival of Georgian, Adam, early Classical Revival, and Greek Revival architectural styles. Interest in classical models was inspired by the World's Columbian Exposition, which was held in Chicago in 1893. The style is based mostly on the Greek, rather than Roman, architectural orders. Because of this, windows and doorways are commonly spanned by lintels rather than by arches. Another hallmark of the Neo-Classical style is a full-height entry porch on the principal facade supported by classical columns in the Ionic or Corinthian orders. The arrangement of windows is commonly symmetrical about a central door. Other features of the style may include monumental proportions, large (sometimes triple-hung) sash windows, pilasters, attic stories or parapets, and simple rooflines.